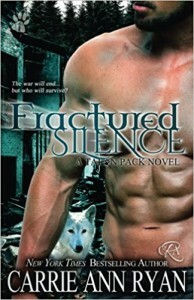 Carrie Ann Ryan’s FRACTURED SILENCE, is an amazing addition to the Talon Pack Series. Parker Jamenson is the son of three Packs and part of a prophecy; Brandon Brentwood is the Talon Pack Omega, and Avery Montag is the daughter of a traitor. The triad needs each other in more ways than one. This contemporary PNR is suitable for adult audiences. Parker, Brandon, and Avery are likeable characters. Parker was goddess-touched and became the voice of the wolves. He is from the line of the first hunter. He is dying and needs to find his mate. Brandon has been struggling with being Omega and is also in need of a mate. Avery is a noble character. She is nothing like her father. She is a good person that wants to make up for her father’s treachery. She is brave and nurturing. She goes through a lot of changes in this story and handles it with grace. The three characters have wonderful chemistry and complement each other well. They are stronger and better together. Once again, Carrie Ann Ryan does an amazing job with her plot. McMaster continues to be an interesting threat. He is a deceptive opponent that should not be underestimated. The prophecy was well integrated into the novel. There are some tragedies that the packs face that made my heart break for the characters. FRACTURED SILENCE is full of details and surprises. The story is skillfully written and hard to put down. I love this series and cannot wait for Carrie Ann Ryan’s next book, DESTINY DISGRACED. I voluntarily reviewed an advance reader copy of this book.